Innovative Southern California chain established some of the first full-scale supermarkets in the early 1920s. Failed entry into Northern California in the 1970s. Acquired by Yucaipa Companies (Cala Foods, Bell Markets, Food 4 Less, and the remnants of the Southern California Alpha-Beta stores) in 1988. Acquired by Fred Meyer in 1997, with Fred Meyer being acquired by Kroger shortly after. Returned to Northern California in 2000 with the purchase of several former Alberston’s and Lucky branches following their 1999 merger. Placed numerous Northern California branches, including all of Cala and Bell on sale in 2005. Not many supermarket companies have a history that can be traced for more than 100 years. Ralphs Grocery Company is one of the few, and, in fact, is currently celebrating 125 years of continuous operation in Southern California. The history of Ralphs is interesting and extraordinary. It is a classic American success story — a story of overwhelming success based on a commitment to quality, service and innovation. Ralphs Grocery Company began by accident — a hunting accident which shattered the left arm of 22-year-old San Bernardino County bricklayer George Albert Ralphs and forced him to find a new occupation as an apprentice grocery clerk in Los Angeles. It was a career change that led to many vital changes in the grocery industry. George Ralphs got his start in the grocery business in 1872 working in a small store in downtown Los Angeles. Within a year, he had saved enough money to buy his own grocery store. Two years later George summoned his brother Walter, who joined him in a partnership to form Ralphs Bros. Grocers. It was a modest beginning. George Ralphs’ first store was a 112-foot by 65-foot neighborhood market at the corner of Sixth and Spring Streets at what was then the edge of downtown Los Angeles. Energetic and ambitious, George Ralphs founded his business with two philosophies in mind – to provide value-priced, top quality products to his customers and to give them the customer-comes-first service they deserved. 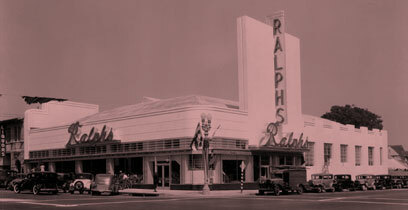 As the city of Los Angeles grew, so did Ralphs – building its reputation for providing quality goods at competitive prices. Today, Ralphs Grocery Company is one of the western United States’ leading supermarket companies with more than 340 modern service-oriented stores serving quality and cost-conscious consumers throughout southern California. Ralphs has long been famous for its innovations. One of the first was a new approach to the traditional handling of fresh produce. To solicit business in the company’s early days, the Ralphs brothers provided lodging for farmers and stabling for their horses when they traveled to Los Angeles to sell their crops. This attracted so many enthusiastic sellers that Ralphs was able to buy entire crops at one time. This was the beginning of two Ralphs traditions — farm-fresh produce and volume buying with the savings passed on to the customer. In 1901, Ralphs moved to a new site at 514 South Spring Street after selling its first store to permit construction of the Hayward Hotel. During the next decade, the company prospered, and in 1909 was incorporated as Ralphs Grocery Company. With the westward shift of Los Angeles’ population, Ralphs established a branch store at Pico Boulevard and Normandie Avenue in 1911. Huge for its day (15,000 square feet, including the basement), it had stables for delivery wagon horses in the rear. Soon after, the third and fourth stores in the Ralphs “chain” were opened at 35th Street & Vermont Avenue and in Highland Park. Expansion accelerated. As Los Angeles grew, other attractive Ralphs stores were opened in modern, elaborate buildings featuring clerk service and home delivery. With expansion came innovations in merchandising. In fact, Ralphs is considered one of the country’s first chain store operations and was a pioneer in establishing the “supermarket” as it is known today. The “chain concept” offered great advantages in volume buying. More stores meant sizeable savings through increased volume buying. And true to its tradition, Ralphs passed these savings on to the customer in the form of higher standards and lower prices. By 1928, Ralphs had 10 stores – and another wild idea. By then, American families were driving their own automobiles. “A car in every garage” was the nation’s dream, fast becoming a reality. The company abandoned home delivery and instituted a cash-and-carry policy, self service and ample free parking. The same year saw another innovation. With bread prices rising, Ralphs opened its own bakery to service its stores and keep prices down for its customers. This was the company’s first venture into food manufacturing, which expanded again in 1932 with the opening of a creamery. By 1936, the company had expanded to 25 supermarket-type units featuring such “radical” departures as streamlined store designs, unobstructed curved roofs, vast expanses of plate glass windows for brighter, more pleasant shopping, wider aisles and bigger and better, free parking lots. By the 1940s, Ralphs supermarkets featured self-service in a number of departments including produce, delicatessen and dairy. Ralphs was an early convert to computer technology and in 1953, made headlines with the introduction of an electronic store billing system at its new grocery warehouse in Glendale. The ’50’s also marked Ralphs’ expansion to the suburbs, as the Southland continued to grow and the downtown area gave way to metropolitan development. In 1974, the company pioneered another breakthrough as the first supermarket chain west of the Mississippi River to equip its stores with laser scanning checkout systems. The new electronic checkstand scanners resulted in faster, more accurate pricing and more efficient customer service. By 1980, all Ralphs stores had been converted to the scanning system. In the 1970s, Ralphs continued adding new consumer-conscious benefits to its supermarket lineup, including unit pricing, freshness code dating and “no frills” generic products. Many other consumer-oriented programs were also instituted during this time, such as the opening of the company’s first in-store floral departments, fresh bakery products without preservatives and super value meat packages that allowed shoppers to purchase “family-size” packages of meat. In 1978, Ralphs became one of the first grocery companies in the nation to offer cost-conscious consumers an alternative to name-brand products and price. The introduction of its “no frills” generic line of Plain Wrap products was front page news in the Los Angeles Times. Since the introduction of its initial line of 21 Plain Wrap items, Ralphs has expanded its “private label” offering to more than 3,500 items under the Ralphs, Private Selection, Perfect Choice, Old Fashioned, Grocers Pride, Equality, Sunny Select, Van de Kamp’s, Buena Comida and Western Hearth labels. Until 1968, Ralphs was one of the few large companies that remained entirely family-owned. Early that year, Ralphs was acquired by Federated Department Stores of Cincinnati, Ohio, and became an independent operating subsidiary of that corporation. The company changed hands again in 1988 when FDS was acquired by the Canadian-based Campeau Corporation, and again in 1992 with The Edward J. DeBartolo Corporation as majority owner. In June 1995, Ralphs was acquired by The Yucaipa Companies and merged with Food 4 Less Supermarkets, capturing the #1 market share in Southern California, the largest retail market in the U.S.
Ralphs Grocery Co. became a subsidiary of Portland, Oregon-based Fred Meyer, Inc. in March 1998, helping establish it as one of the 5 largest food and drug retailers in the U.S. Operating as a separate subsidiary of Fred Meyer, Inc., Ralphs continues to maintain its own unique merchandising and customer service philosophies while also realizing the many efficiencies of being part of a larger organization. The company’s future course has been chartered in a series of forward-looking plans, which lay the foundation for Ralphs to continue its tradition of service, quality and competitive pricing. Central to those plans is the company’s philosophy of continuously opening, improving and upgrading its stores with service, merchandising and design enhancements. From the very beginning, Ralphs has responded to the changing needs of Southern California consumers. Today, Ralphs continues to set the pace with the attractive, shopper-friendly design of its newest supermarket prototypes, which emphasize attractive food presentation, high-quality perishables, superior service and value. Under the direction of CEO George Golleher, the company presently operates 320 conventional Ralphs and Hughes supermarkets and 80 warehouse format Food 4 Less stores in Southern California. In addition, the company also has 27 Cala Foods, Bell Markets and FoodsCo stores in Northern California and 38 Falley’s and Food 4 Less markets in the Midwest. The company’s conventional-style Ralphs supermarkets are designed for customers looking for quality, nutrition and price, have limited time, desire a wide selection of items and who prefer shopping at one location. Efficiently laid-out to make shopping easy, the typical modern Ralphs supermarket is 45,000 gross square feet in size and carries approximately 30,000 different items in such well-stocked departments as those dedicated to dry groceries, frozen foods, wine and liquor, produce, meat, fish and dairy products, along with a wide assortment of general merchandise, and health and beauty aids. Most Ralphs conventional-style supermarkets also feature richly appointed in-store bakeries, service delicatessens, floral counters, and European-style service seafood departments. Its Food 4 Less warehouse stores are larger, averaging more than 50,000 square feet, and designed to offer consumers a low-priced alternative to the typical conventional supermarket. Most locations offer a service deli/bakery. Many Food 4 Less stores are located in inner-city neighborhoods and other under-served communities across Southern California. All of the company’s stores are supported by an extensive network of modern warehousing, distribution and manufacturing facilities. In March 1996, the company opened its Riverside Distribution Center & Creamery, a sprawling 90-acre, state-of-the-art complex featuring more than one million square feet of warehousing space for dry grocery, dairy/deli and frozen food storage, and a creamery facility. In Glendale, Ralphs operates a 450,000 square-foot dry goods warehouse and a 10-story computerized storage center. Ralphs’ 200,000 square-foot Perishables Service Center (PSC) in its Compton Central Facilities Complex is one of the most advanced warehousing facilities of its kind. The PSC serves as the central distribution center for the majority of perishable products sold at Ralphs and Food 4 Less stores, including produce, floral, dairy, deli and meat items. Also within the Compton Central Facility is a Delicatessen Kitchen and Creamery manufacturing plant serving up a large selection of milk, cottage cheese, yogurt and award-winning ice cream products. A large bakery facility in La Habra produces a wide variety of bakery products for Ralphs and Food 4 Less stores. Ralphs Grocery Company has come a long way from its modest beginnings in 1873. And while the company is modern and dynamic, it still operates on the same sound principles upon which George Albert Ralphs founded it so many years ago – an unwavering commitment to customer service, quality products and significant savings.